Violin Box Lock ...It works Great for a wall art, but will work as a lock on Iron gates or garden decor15 inch tall x 13 inch wide x 1 14 deepThere is no finish so it can be cleaned and oiled or kept as shown. 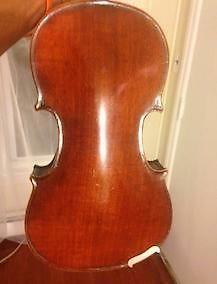 VERY OLD VIOLIN IN GOOD CONDITION HAS SMALL REPAIR. COMES WITH CASE AND EXTRA STRINGS, ECT. SELLING FOR $195. PHONE show contact infoIN WHITEFISH. 3 antique violin cases for sale. 2 are coffin style cases. All 3 for $100 or$50 each. Made in Chicago. All original parts. Great condition.